This is a great “intro to tofu” recipe. If you’ve tried tofu before and thought it tasted like feet, you’ll be pleasantly surprised. I’ve included the brands I use, in case you’re curious. One packet of Bearitos Taco Seasoning. One package of firm or extra firm tofu (I like Soy Boy LoFu). 15 oz. can of Eden organic black beans, rinsed & drained. Cut the tofu into 1/2 inch cubes. Cook over medium-high heat in 2-3 tablespoons of canola oil until browned slightly. Mix in taco seasoning and 2/3 cup water. Bring to a boil. Turn heat to low and simmer, uncovered, for 9-10 minutes. Heat refried beans in the microwave for 1-2 minutes. 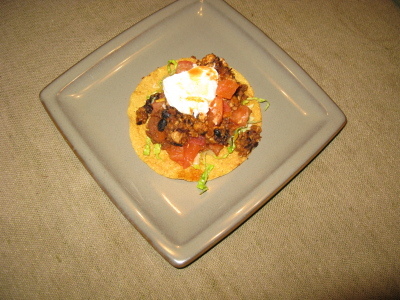 Spread refried beans on the tostada shells, then layer tofu & black bean mixture. Top with lettuce, cheese, tomatoes, etc. When I made this, my husband and I pigged out on tostadas and still had enough to pig out again at lunch the next day, so I think this should serve four or five people easily. It’s quick and easy and I swear the tofu doesn’t taste at all like feet.